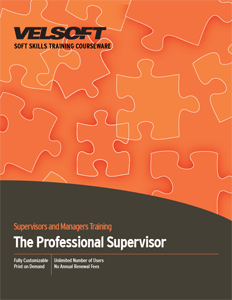 This training courseware title provides everything you need to professionally deliver The Professional Supervisor training including editable training manual, hands-on exercises, exercise files, detailed instructor guide, classroom-ready PowerPoint slides, and unlimited online learning licensing. Seeing is Believing This sample manual to teach The Professional Supervisor is in MS Word format. In today's changing workplace, many new supervisors are unsure of their roles and responsibilities. They have little experience dealing with the challenges of managing work through others. They haven't had the opportunity to develop those critical skills of planning work, leading their group, and communicating with their employees, their colleagues and their manager. Learning these skills can have a tremendous impact on an organization's productivity. Participants will learn some ways to deal with the challenges of the role. Participants will acquire a basic understanding of and develop strategies for leadership, team building, communication, and motivation and what part they play in effective supervision.